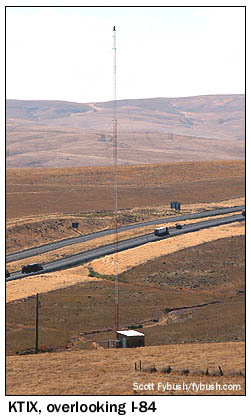 Another one of the long driving days of our trip found us pulling out of Lewiston, Idaho fairly early in the morning, heading west on US 12 and again crossing, very briefly, the path of Big Trip 2006. Back then, we spent a night in Walla Walla, Washington and saw pretty much everything there was to see in town, tower-wise; this time, the Big Trip-mobile didn't even stop as we turned south on Washington 125 and crossed into Oregon, passing through Milton-Freewater and Weston on the way to a lunch stop in Pendleton. Just as our previous day's drive took us through areas that were far from postcard Washington State, this isn't the Oregon of pine trees, mountains and coastal waters. This part of Oregon is desert and emptiness, and there's lots of both here. 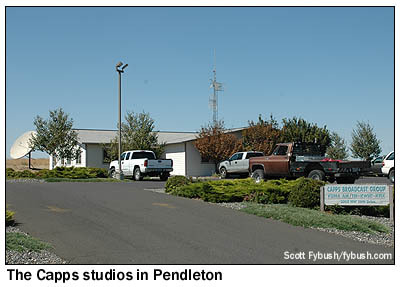 Most of the Pendleton radio dial is in the hands of one company: Capps Broadcast Group, which owns both AMs, sports KTIX (1240) and news-talk KUMA (1290), as well as AC KUMA-FM (107.7) and country "K-Wheat" KWHT (103.5), which also serves the Walla Walla area, 35 miles to the northwest. 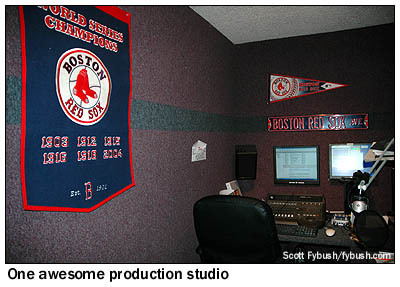 The Capps studios are located in a newish building next to the Pendleton airport, on the west side of town overlooking I-84. 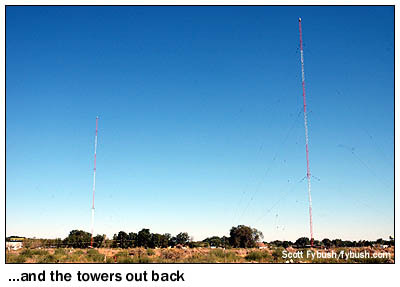 The KTIX tower is just down the hill, though I'm told this is a relatively recent move from an earlier tower site closer to town. 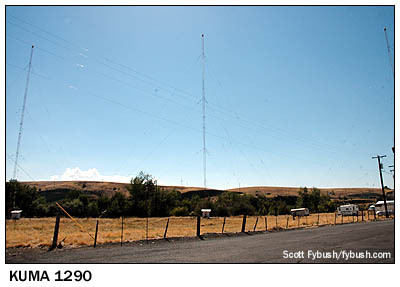 KUMA(AM), a three-tower, 5 kW directional signal, comes from an array on the east side of town, alongside the Umatilla River just north of the US 30 bypass that passes through downtown Pendleton, the commercial center of east central Oregon. 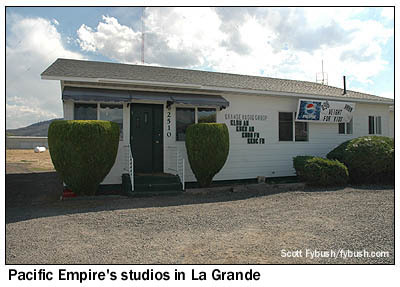 It's about fifty miles down I-84, through increasingly hilly terrain, to the other decent-sized city in this area, La Grande, and Capps has a presence here, too, in the form of country KCMB (104.7 Baker) and AC KWRL (99.9 La Grande). Their studios are located on Adams Avenue, the main drag that carries US 30 through town, and as we seek them out, we find something that defied easy explanation - a billboard (which, regrettably, we failed to photograph) promoting a radio station called "U-Rock 101." What was that? 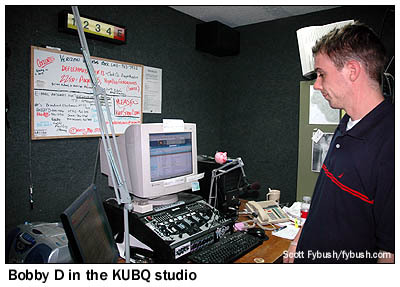 It turns out to be translator K266AJ (101.1 La Grande), which relays "U-Rock 96," KLKY Stanfield, from 80 miles or so to the west, though we didn't figure that out until just now, as we researched this week's column. 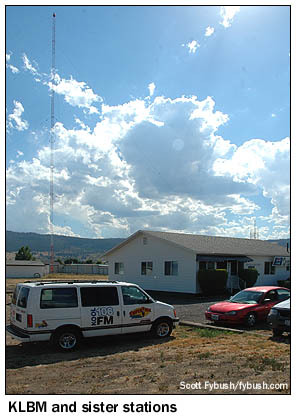 Just east of downtown, 2510 Cove Avenue is the transmitter site for news-talk KLBM (1450 La Grande) and the studio site for KLBM itself and its Pacific Empire Communications sister stations: simulcaster KBKR (1490 Baker), oldies KKBC-FM (95.3 Baker), classic rock KUBQ (98.7 La Grande) and oldies KRJT (105.9 Elgin). With many more hours of driving ahead of us - 180 miles or so down I-84 to Boise, not to mention "losing" an hour as we return to Mountain Time, plus a deadline of sorts to meet in Boise - we're about to get back in the car after snapping a few quick shots of the Pacific Empire building when we see someone come out the door to see what we're up to. After a quick explanation, we're invited inside for a tour, where we learn that our new friend is Bobby D, program director for the cluster and afternoon host on KUBQ. 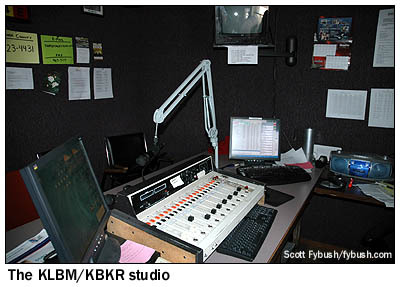 The rest of the studios are pretty basic (yes, that's a Numark DJ board in the KUBQ studio), but they get the job done to bring local radio to this very small radio market, and it's always nice to see people as enthusiastic about the business as our new friend Bobby D.
Two of the stations operating out of this cluster - news-talk KBKR and oldies KKBC - can't really be heard very well in La Grande. That's because they're licensed to Baker, 40-odd miles over a mountain range to the southeast, and after saying farewell to Bobby, our next stop is at the tower they share on Sunset Lane, just off the side of I-84 near the downtown Baker City exit. 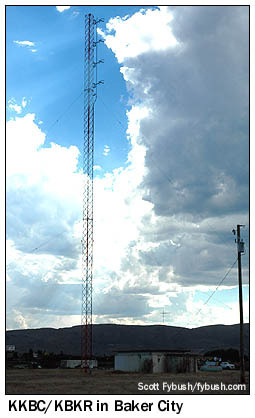 No, there's no fence around the base of that tower, nor does there need to be - the AM side of this operation is a shunt-fed antenna, though it's hard to see in this picture as the sun emerges from the clouds behind the tower. 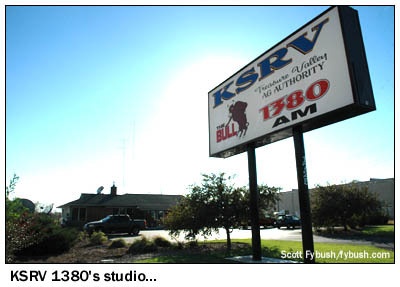 KSRV's AM sister on 1380 remains right here in Ontario, alongside US 30 as it becomes the frontage road to I-84 north of downtown, and we see its two-tower array and small studio building before hopping back on the freeway and crossing the border into Idaho. Our last stop of the day is in Boise itself, another hour or so away, and it's the one and only baseball game of the trip. 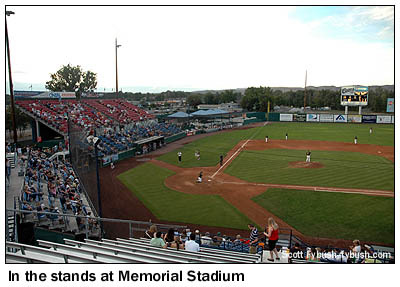 The Boise Hawks are part of the short-season class A Northwest League, and they play at Memorial Stadium near the Western Idaho Fairgrounds on the northwest side of town. 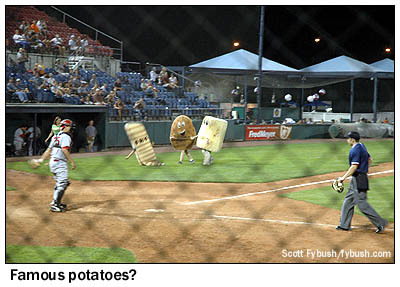 Oh, and check out that between-innings action - the mascots racing down the third-base line are, in good Idaho fashion, the french fry, the baked potato and the tater tot! 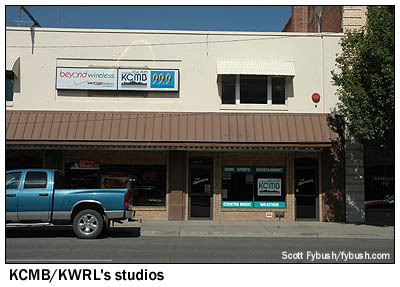 Ready to see a whole bunch of Boise radio? We'll keep you busy for a few installments, starting next Friday. In the meantime, stop by Tophour.com next Wednesday to hear IDs from Pendleton, La Grande, Baker, and even a few that we picked up along the way in Walla Walla. Thanks to Bobby D for the tour!